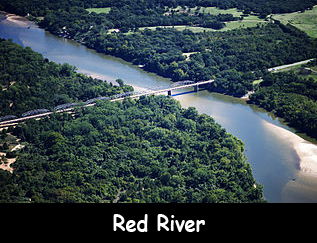 The Red River is a tributary of the Mississippi River and has a length of about 1,360 miles long. It begins at the confluence of the Bois de Sioux and Otter Tail rivers and flows north. It flows into the Atchafalaya River, into Atchafalaya Bay and finally into the Gulf of Mexico. It creates the border between North Dakota and Minnesota. This river has a high salt content. It has got this name by the color of its watershed. Captain Henry Miller was the first one to bring up a steamboat along the river in 1815. There is a bridge across the Red River called the Jimmie Davis Bridge. It joins Shreveport and Bossier City. There is a dam built on this river. It is known as the Denison Dam and was built in 1943. The average flow at the mouth of the river is more than 57,000 cubic feet per second. It travels in four main branches which are the Prairie Dog Town Fork, Elm Creek or the Elm Fork, the North Fork, and the Salt Fork. There was a 160 mile log jam in 1839 along the Red River which finally cleared completely during the 1870s. It is prone to severe flooding, particularly during the spring as snow melts and river ice breaks up. The most recent flood occurred in 2015 which caused the areas of Shreveport, Louisiana to experience flooding. This river was recognized as a boundary by the Republic of Texas in an act of December 19, 1836. The last 175 kilometers of the river is designated as a Canadian Heritage River. This part is located in Manitoba. Declan, Tobin. " Fun Facts for Kids about Red River ." Easy Science for Kids, Apr 2019. Web. 24 Apr 2019. < https://easyscienceforkids.com/red-river/ >.